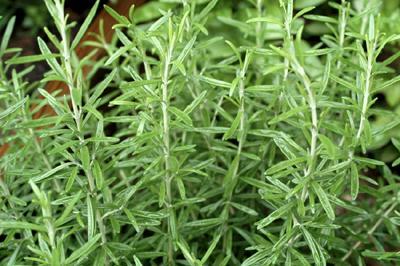 Rosemary, Rosmarinus officinalis, is a Mediterranean herb with culinary, medicinal and cosmetic uses. It is also an attractive ornamental shrub with small white, blue or lavender flowers in spring and summer. The narrow leaves are evergreen and can be dark, leathery green or a soft grey-green. Its growth habit can be upright, from 1 to 6 feet tall, or trailing, depending on the variety. The Greeks believed the scent was an aid to memory, and it is still associated with memory today. It is also a symbol of faithful love. The name rosemary comes from Latin words that mean "dew of the sea", because it is found growing wild near the sea. The plant prefers warm, dry climates but is adaptable and will grow anywhere in zones 8 to 10. It likes light, alkaline soils that drain well. In cold climates, rosemary can be treated as an annual, or grown indoors or in a greenhouse. To successfully keep as a houseplant, place in a bright window or under a plant light. Mist frequently and water when the top inch of soil is dry to the touch. A cool, well-ventilated spot is best. Harvesting the tips of the branches will encourage bushier growth. Prune after flowering by shearing or pinching back. It is easy-going, generally untroubled by pests or diseases. Plants can be increased by seed, cuttings or layering. To layer, bend a supple stem toward the ground or a pot of soil and pin it down, covering with a mound of soil. Keep the spot moist and it will root from the nodes. Once well rooted, detach from the parent plant and repot. In the garden, the herb can make a good edging and is quite at home in a rock garden. The trailing form is excellent in containers, on slopes or hanging over a wall. Plant alongside other herbs, or pair with blue fescue, hebe, sunrose or lamb's ears for a Mediterranean display. Rosemary can be pruned into topiary shapes, such as standards or pyramids. The flowers attract bees and other beneficial pollinators. Like most members of the mint family, the plant is strongly aromatic. Its oil has a long history of use in perfumes, soaps and as a hair tonic. In the kitchen fresh or dried is added to vegetable dishes, potatoes, fish, and desserts. For the best flavor, harvest new leaves for drying before the plant blooms. Medicinally, the young shoots are distilled to treat fatigue and stomach disorders. Adding sprigs to bathwater has a calming effect.